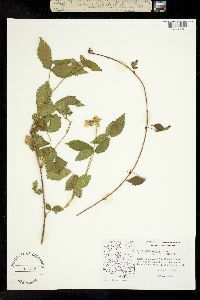 Plant: woody vine; flowering branches erect to ca. 1.5 dm tall, the old epidermis not flaking off; plants eglandular, glabrous to minutely villous; prickles very sharp, stout, broad-based, laterally flattened, hooked, down-turned Leaves: widely spaced, imperfectly deciduous, green above, paler green below; leaflets usually lanceolate to obovate; margins serrate to doubly serrate; primocane leaves (5-)7-11(-15) cm long, 4-8(-11) cm wide, palmately 3-5-foliolate or pedately (having lateral leaflets deeply lobed) 3-foliolate; floricane leaves 4-9 cm long, 2.5-9 cm wide, 3-foliolate INFLORESCENCE: simple cymes with 1-6(-8) flowers terminating short, erect, lateral branches, sometimes surpassing the leaves, bracteate, often leafy at the base Flowers: sepals usually reflexed, often apiculate to caudate, 4-10 mm long, the main portion ovate to lanceolate, the margins tomentose; petals white, 8-12 mm long; pistils glabrous Fruit: small, tasty, sub-spherical, coherent, fixed to the fleshy torus; drupelets dark red, glabrous, fleshy Misc: Shady places in riparian areas and near springs; 450-1850 m (1400-6000 ft); Mar-Jun REFERENCES: Brasher, Jeffrey W. 2001. Rosaceae. J. Ariz. - Nev. Acad. Sci. Volume 33(1).